Are you a big fan like me of the hit BBC fantasy series called Merlin, also shown on the SyFy channel? Perhaps you are buying a gift for someone who is a fan of it. 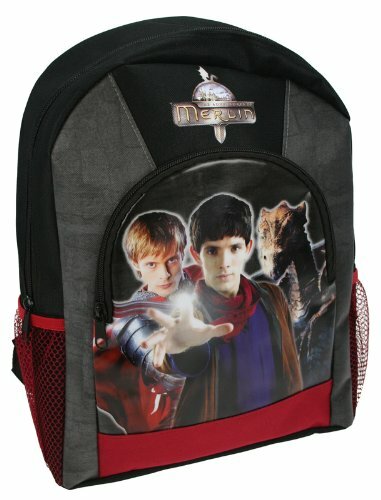 This page features a selection of magical wizard themed merchandise along with related King Arthur items and goodies too. 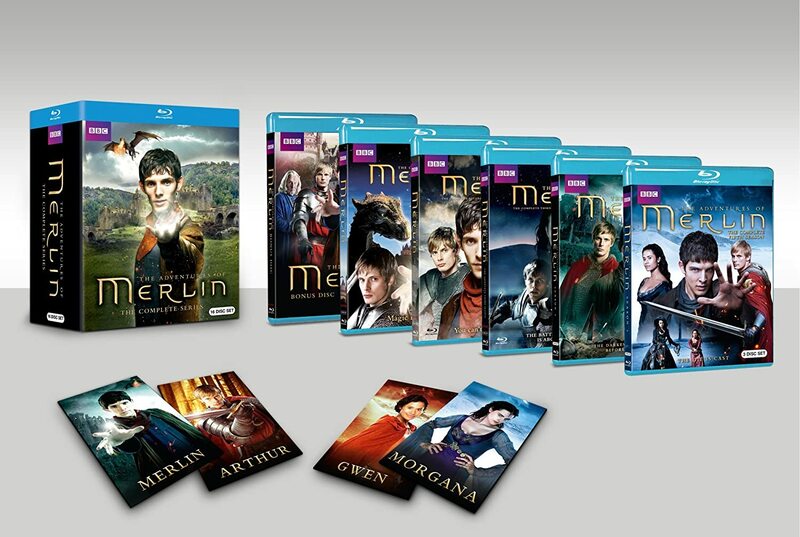 It's got some good The Adventures of Merlin gifts for fans. It was totally gutting to discover that series 5 was to be the last ever series of this fantastic BBC hit. However, that’s when I decided to keep the memory of this awesome show alive with this fan gift page. ⭐ I’ve watched the whole series of The Adventures of Merlin more than once on DVD and I really miss the characters which I grew to enjoy seeing. It is such a shame that they never made a movie, though the magic of it still lives on. 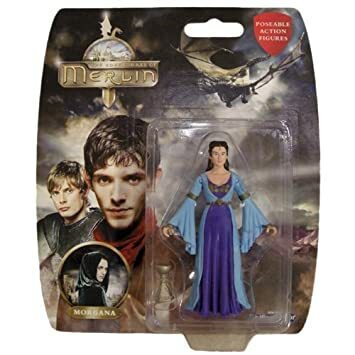 The Adventures of Merlin action figures are really pretty good in my opinion. 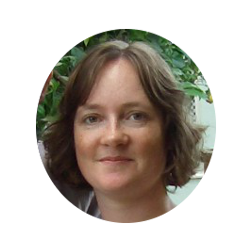 You know how sometimes they really look nothing at all like the characters. Well, the young warlock does look very similar to our Colin Morgan who played the title role in the BBC series. 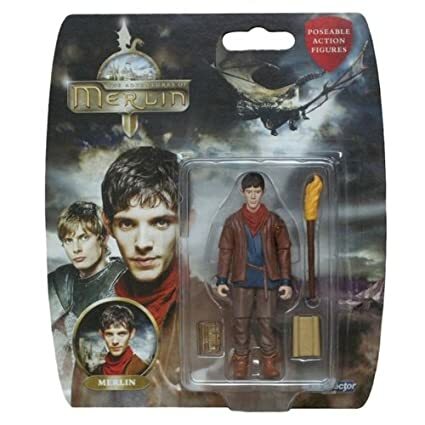 The Merlin figure is almost 4 inches tall, can be posed and comes with a flaming torch plus a scroll and magic book. Everything that a young wizard needs I guess. If you’re planning a themed party then why not use one of these figures as a birthday cake topper? 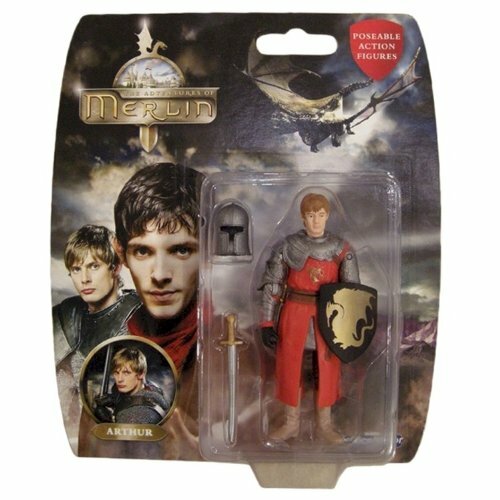 ⭐ There are several more Adventures of Merlin action figure toys from the series which is also screened on the American channel SyFy. Do check out the limited edition dragon. My favorites, apart from the young wizard or sorcerer himself of course, are Prince Arthur and King Uther since more thought has been put into those characters with the accessories that they also have. They also look more realistic too. 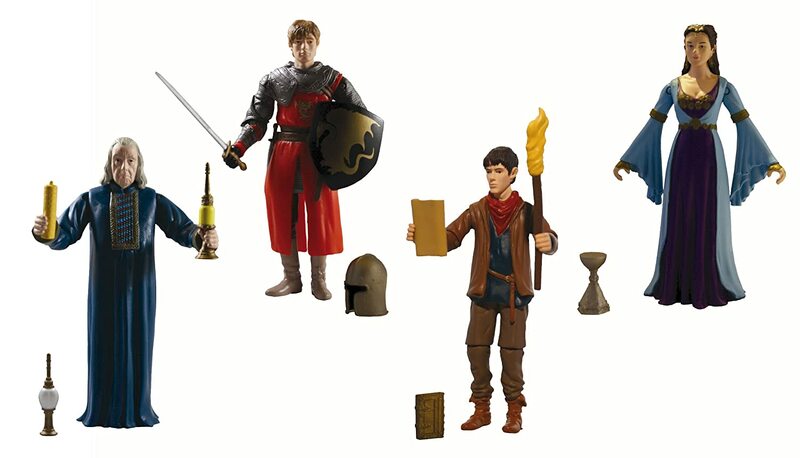 You can also get hold of Gwen or Guinevere, Morgana and Gaius figures. 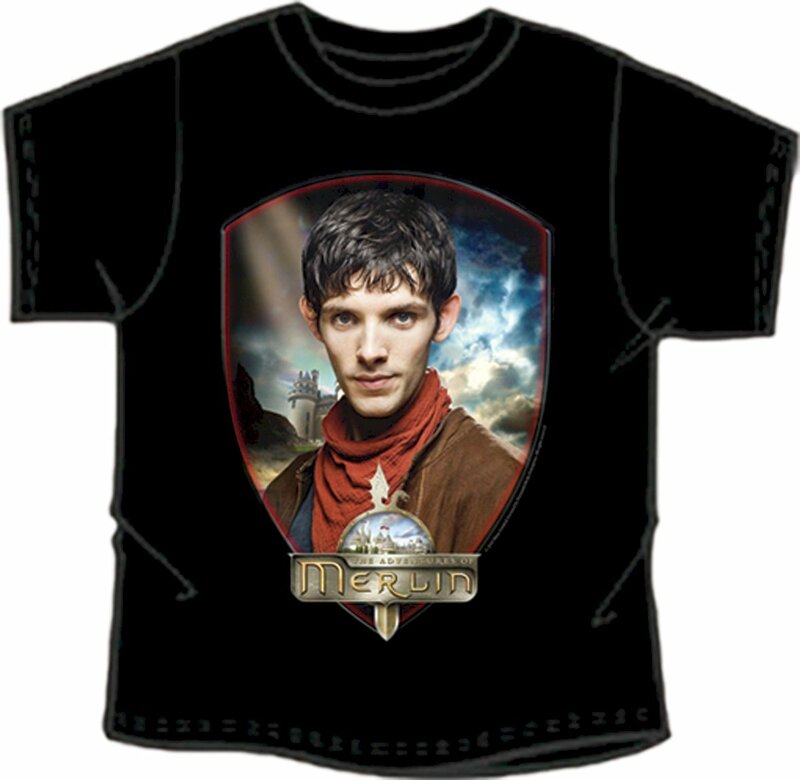 I love this design of Merlin t-shirt which features a recognizable head shot of this character. You can get other designs with quotes from the opening sequence such as: In a Land of Myth and a Time of Magic. This adult top looks like a pretty magical piece of gear to collect. There are some official BBC t-shirt designs available which you can get with Merlin or Arthur in a range of adult and child sizes. The official designs have a printed transfer on the front which means that they are, in my experience of owning them, probably best suited either for display or very occasional wear. The transfer image design doesn't, in my honest opinion, tend to wear or last as well. 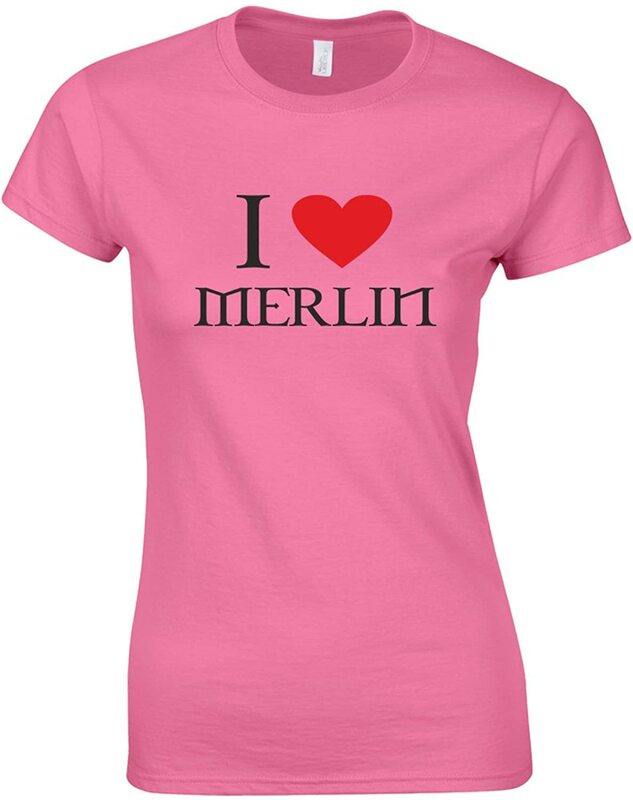 You can also pick up lots of I Heart Merlin items over at places like Zazzle and there is a good t-shirt design that is available. All of these items can be personalized too which makes a great design for a fan. Now you can buy the complete series as one set on DVD or Blu-Ray. Sadly all mine were individual series box sets because I just could not wait, I had to get them as soon as I could. The final, 5th series is a must-own for any fan and especially because The Adventures of Merlin series has now sadly finished and will be no more. Series 5 is the set that you really don’t want to miss, especially if you are like me and you already have all the other complete season box sets as well. Lucky for me that it always came out just before my birthday so it was always a great gift that I looked forward to receiving and watching. Now you can order the complete series set along with bonus features. I love this Lady of the Lake poster with its Arthurian connotations. The sword she is holding up is Excalibur which Arthur managed to pull free from the stone. There are other items available with this same design. There are no official mug products that you can buy for sale but you can find lots on this theme available at Zazzle which have a great selection of mugs that any fan would probably really enjoy. Look out for Mordred’s Castle Cleaning Service which is a funny design and the I heart Merlin ones as well. Mugs can make for great gifts since they are not only practical but they can easily be put on display too. If you’re gifting a mug, why not fill it up with candy, small treats or little gifts and then wrap the whole thing in some colored cello wrap, tying off with curling ribbon over the top of the mug. This really makes your item look so much more thoughtful. There is a Camelot Calendar at Zazzle that may not be based on the BBC Series but it really features a wonderful set of 12 King Arthur inspired illustrations. Previous versions of this amazing design included: Sir Gawain, Excalibur, Merlin, Sir Lancelot, The Isle of Avalon, Green Knight, Sir Dinadan, Lady Ettard, Sir Marhaus, Lady Lunete, the Hermit Nacsien and King Mark. You can check all the designs in the latest calendar to see what they are. This would really suit an adult who is a fan of the Legend that surrounds King Arthur. Also look out for the old official wall calendar that features a main character from the BBC Series for every month: check out Gwen, Gawain, the Dragon, the Sorcerer in both young and old guises, Morgana, Arthur, Gaius, Mordred and more. This now makes a great collectible item which you can often source at Amazon or eBay. Now that this series has come to an end, I’m no longer sure how long you will be able to collect any of the official merchandise at least. 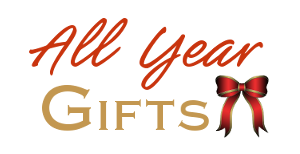 But do come and take a look at the selection of gifts on this page that may be still available. Thank you for the hours of enjoyment watching the series to the young Merlin sorcerer, played by Colin Morgan, and his closest friend Arthur Pendragon, played by Bradley James. And thanks to the rest of the cast too, it was a blast while it lasted. 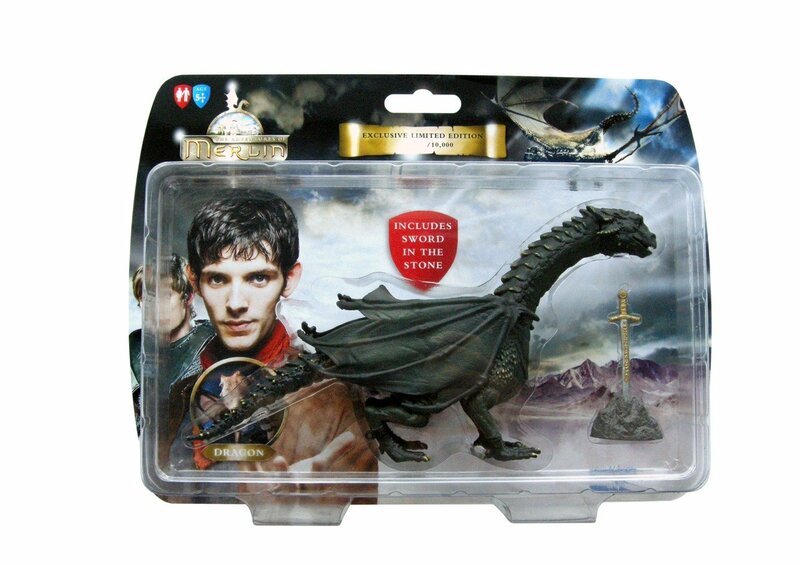 Have fun collecting your Adventures of Merlin gifts and collectibles.